Loading Dock Equipment - Dock Bumpers, Dock Boards, Dock Lights and Dock Equipment! America's "One Stop Loading Dock Store"
open from 9am to 5pm Eastern Standard Time. Maintenance free, weather resistant, and highly effective impact absorption make dock bumpers one of the most essential components of the loading dock operation. With a variety of heights, widths, thicknesses, and the warranty to back them Loading Dock Supply has the bumper solution for every loading dock operation. We also offer a wide selection of molded dock bumpers and extruded dock bumpers. 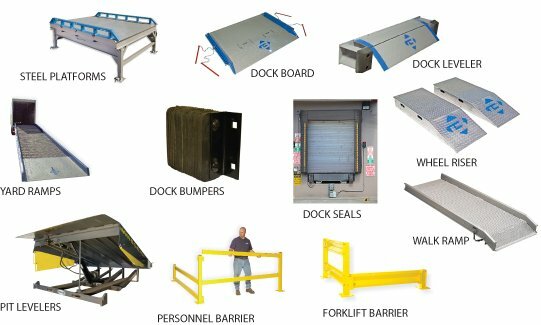 Select from Laminated Dock Bumpers, Extra Thick Dock Bumpers, Extra Long Dock Bumpers, Steel Faced Dock Bumpers, Durasoft Dock Bumpers, Molded Dock Bumpers, and Extruded Dock Bumpers. Dock Boards and Dock Plates make great bridges for loading and unloading Semi Trailers. We have many styles and sizes to choose from: Aluminum Dock Plates and Aluminum Dock Boards, Steel Dockboards, Model T Dockboards, Red Pin Dock Boards, Container Ramps, Industrial Yard Ramps, Rail Boards and other ramps used for loading and unloading freight from Semi Trailers and Rail Cars. A Loading Dock Light will provide great illumination while loading or un-loading a trailer. We offer many different styles and sizes of dock lights. To see our collection please Read More. Strip Door Kits are great alternatives for walk through doorways. The barrier a Strip Door provides will lower noise, and help save in heating or cooling costs. Loading Dock Supply offers assembled strip doors as well as strip door kits for the do it yourself applications. Compression Dock Seals and Dock Shelters Dock Seals are essential to saving energy at the warehouse. Conserve the heating and cooling at the building by sealing the doorway to the trailer. Dock Levelers, Hydraulic Edge of Dock Leveler, Low Dock Leveler parts and accessories. Loading Platforms - Designed for a variety of situations in the industrial community, loading platforms are a fast, economic way to expand your dock area and increase freight handling capabilities without the expense of site or concrete work. Keep out rodents, insects, dust, and other irritations with pit leveler brush seals. Designed to fit in the space between your dock leveler and dock pit, brush seals effectively seal a dock leveler virtually air-tight when the roll up doors are closed. Choose from mechanically fastened or weldable brush seals available as single pieces or in kits for easy setup.